Well, it is good to be back from Columbus and even better to be back in the blogging community where I can breathe the fresh, incense-thick air of Catholicism. I will not call it "traditional" Catholicism, because the Catholicism I witnessed while I was at NCYC in Columbus was not really Catholicism at all (it was more of a pan-Christianity) and I have come to the greater realization that the Catholicism that the traditionalist movement represents is not traditional Catholicism but is simply Catholicism, pure and simple. At least I know that what I witnessed in the three days I was at the National Catholic Youth Conference will give me ample blogging material for weeks to come. A few disclaimers before I go into NCYC: first, NCYC is not a monolithic event, but a huge convention in which over 500 separate organizations participate. Therefore, I will refrain as much as possible from making blanket statements about the entire event. I met wacko liberal-commies there, and some really good priests and nuns as well. Second, I will point out the good as well as the bad and let the reader decide. Finally, NCYC is sponsored and organized by spiritandsong.com, GIA and OCP, the most liberal liturgical music companies out there. The following will be a brief run down of what I saw and heard. On day 1, our arrival was immediately marked by sorrow as we learned that a 16 year old girl, Veronica, from the Diocese of Las Vegas was struck dead by a car while walking down the street at night. Please pray for her soul. Give me a"C." Give me a "A." Give me an "F." Give me a "L," I," "C," and what's that spell? "Caflic." What's that spell? "Caflic." At another point, they said they were going to teach us a Latin word and I was happy, until they said the word: "Whoohah." This "Latin word," they told the audience, meant, "I love Jesus with all my heart," and then they got the whole crowd to go "Whoohah! Whoohah!" I laughed because I realized that since nobody knows Latin anymore, the kids probably thought it was a real Latin phrase. "By the power vested in me as the president of the NFCYM, and with great arrogance, I proclaim Saint Veronica a saint of the universal Church and declare that she is living with the saints in the Kingdom of Heaven." Talk about an automatic canonization! He had 20,000 people in front of him and he had the opportunity to ask for prayers for her soul. Did he? Nope. He proclaimed her a saint to the uproarious applause of everybody. Later, I took some kids aside and told them that they needed to pray for her soul, despite the President of NFCYM's canonization. Thankfully, her name was mentioned at a Mass later that weekend. Waters of the earth, rivers flowing deep: renew us. Crystals of rain, falling from the clouds: renew us. We all knew it was meant to refer to the Holy Spirit, but nothing in the lyrics actually said anything about the Spirit. They were all ambiguous New Age type terminologies. Then we had to listen to this troupe of kids come up and tell us where they were from. But they just said a bunch of estoteric mumbo-jumbo, like, "I am from the rain of a thousand hopes," and "I come from deep thoughts and living dreams." It was very odd. Nza mu ra nza! Nza mu ra nza! Ana kona waku fa na na na ye! Ana kona waku fa na na na ye! They told us what it meant, but I can't remember. A person sitting by me thought this was an appropriate moment to take a jab at Latin and said, "See what happens when you pray in foreign languages! Nobody understands!" Of course, if all our morning prayers had been prayed in this language for centuries, I think we would have a better grasp on it. But I didn't bother to explain. Every song we sung had every alternate verse in Spanish as well. One of the kids with in my group, without any prompting by me, remarked, "Boy, the Latin-haters sure love Spanish." It was a very witty and true observation. That was all just day one. I'll update you on days two and three later. It gets even better. CLICK HERE FOR PART TWO OF THIS POST! NEW! 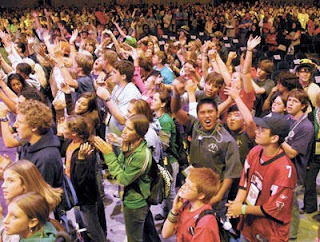 Updates and other posts relating to 2007 NCYC below! Frankly, I'm schocked and scandalized and I expected it to be bad. Did he really even go so far as to acknowledge his own arrogance in proclaiming that poor girl a Saint? Wow...I threw up a little in my mouth. Those were his exact words. I wrote them down verbatim because I could not believe he said that. Anselm..... you used to need 2 miracles for the canonization process. We see the first.... the guy was miraculously made an instant pope. The second occured when he was not stoned to death for his blasphemy. I predicted all of this a couple of days before it happened. I hope your stay in Columbus wasn't all that bad though. It really is a wonderful city. wow, I am sure McCarty was intending that to come of someone light-heartedly but, wow, what poor judgment. Does it not pretty much mock the concept of Sainthood? What really disappoints me is that presumably nobody of authority called him on it and reprimanded him. I know I saw a Bishop there. Why didn't someone make him apologize. Not only was there one bishop there, there was 20 there! They even had this workshop called "Ask a Bishop" where you got to sit down face to face with a bishop and bring up whatever was on your mind. How I would have loved that! But it was youth only. At the closing Mass, 6 bishops were present. Why do these people feel the need to immitate pentecostals? Watching those people is seriously embarrassing. They clearly have good hearts, but they're being seriously mislead. The Bishops think that mass sacrilege will bring back the youth, but they're wrong. We've abandoned dignity and solemnity in Catholic liturgy at our own peril. I pray that the Traditional Latin Mass makes great strides in the future to show people what true worship is. I happened to be in Columbus last weekend for another conference, but most of the people in my hotel were kids attending the NCYC. They were cute, enthusiastic, having a good time - but not even remotely Catholic, and I have no idea what they got out of it. All I saw was people running around saying "Praise Jesus, praise Jesus," and having group hugs. It was basically an Evangelical event, all fluff, emotion and entertainment. I'm appalled to read what that man said about the poor girl who was killed. The group had arrived after the hotel restaurant was closed and had gone to a nearby all-night McDonald's to get something to eat, and on the way back, a pickup truck ran up over the curb and struck the girl walking nearest to the road. The awful comments of this man trivialized her and made her death sound like a joke. I'm disgusted. Prayers for the Veronica and her family, and in fact, for her group, who left immediately and returned to Las Vegas. I found your blog at Fr. Z's blog. Thanks for posting this kind of thing. It looks very much like The Los Angeles Religious Education Congress held here in southern California, except the age difference of course. My husband and I have recently been attending the Traditional Latin Mass that has just started at a parish by our house. I am in heaven with this Mass . I feel at peace there. No distractions! I could actually pray the way I have been longing too pray. I just couldn't really explain it for years but something always felt disturbing with masses like the one you show in the video. My husband and I are raising a new generation of Catholics who will experience the richness and beauty of The Catholic Faith something both my husband and I were barely or never exposed to growing up in the 70's and 80's. We will never allow our children attend a conference like that one held in Columbus. In fact we have beeen teaching them about proper music and rubrics( no glass chalices, dancing, inncence pots etc..) for The Holy Mass. Pray for us! California is a battle ground for the Catholic faith. Assuming it was supposed to be a joke, you would still never use the death of a 16yr old coming to this gathering as a subject. If he was serious, I'm afraid it is off to the funny farm with this man. AHHH! I saw the youtube movie of this over at Fr Z's and I literally had my hands over my mouth as my jaw hung down it utter astonishment of what is "allowed" today under the banner of "Catholic Mass". Imagine if those kids got to see just ONE Solemn High Mass at the local Cathedral, I guarantee there would have been instant fans of what the Church really has to offer. First time visit here (thanks to Fr. Z.). I live in a neighboring state from where NCYC was held, and I know the parish I teach CCD took some kids from the Youth Group to it. I was afraid of this. I taught many of the kids who went over there. The problem -- at least from the standpoint of where we are located -- is that our Catholic kids in this area is affected in an adverse way by Young Life and Crysalis (the latter being the teen protestant version of the Catholic "Teens Encounter Christ"). Many of our kids come away from Young Life with the "it doesn't matter which church you go to as long as you love Jesus" mind-set. Similarly, the Crysalis not only gives them this mind-set -- it is also very much focused on "feelings and emotionallism." Thus, truth becomes whatever you make of it (if it FEELS right for you -- it must be YOUR truth -- IOW, relativism). Sadly, what happened with the emotionalism at NCYC feeds this same mentality. Hello! Stumbled upon your blog, courtesy of Fr. Z. As a traditional Catholic mom of 9 who attends the Traditional Latin Mass in Columbus, I thank you for so clearly expounding upon all the reasons why my oldest son at home was not allowed to attend this conference. I had hoped that the NCYC would be "Catholic Lite" at worst, though the promotional video certainly proclaimed more of a "Rockfest for Jesus." I'm extremely disturbed by the "pseudo-canonization" of that poor young woman. Shame on Bob McCarty! May her soul and the souls of all the faithfully departed, rest in peace! My husband and I are converts. My mother and father are converts. My grandmother is a convert. It wasn't rock-n-roll and pep rallies that brought us to the faith! We've lived through the horrors of a liberal parish with the NCYC brand of youth program. It did nothing to build the faith of our children. Mass was a struggle every Sunday. Nearly three years ago we moved to the Columbus area and began attending the Traditional Latin Mass. Our four sons serve at the altar every Sunday. Everyone of us longs for Sunday! The TLM can change the world...it's ashame that these young adults are being "fed" baby food when there is a banquet awaiting them. I am flabbergasted at these (NCYC) quotes. I'm totally on your side for this one. I'm also flabbergasted at your disdain for youth events. I'm surprised that your blogging is so narrow-minded when it comes to your Catholic faith. Didn't one of our greatest popes and saints embrace "youth rallies"? Didn't this man also draw 1,000's of young men to the priesthood because of his example of faith? If you are referring to John Paul II, I do not think he was one of our greatest popes and he certainly has not been declared a saint or even a blessed yet. Furthermore, I think his youth rallies were not the best thing for him to be doing and I question the message that was being sent to the youth by them. Ultimately, the message sent by these kind of events is "as long as you love Jesus, everything is fine." Under JPII all the problems in the Church only got worse; how can we have liturgical renewal when JPII encouraged liturgical deviations at the scandalous WYD masses? Where did I say I thought Youth Rallies were intrinsically or inherently morally wrong? The vast majority of your quotes and observations regarding NCYC are completely inaccurate, and that you post them here as 'fact' is misleading and borders on slander. What is even worse is that there are people with no firsthand knowledge of the event that actually believe the scenarios you present. I find it amazing that anyone would even let you minister with young people considering your narrow mindedness and lack of correct theology. When I saw your comment, I reread my two posts on NCYC and I stand firm that this is what was said there; in the case of Bob McCarty's "canonization" and the Br. Mickey's comments, these were written down verbatim as soon as they were said because I myself was so shocked that I wanted to make sure that I did not misquote them. Were you in the room with myself and the other 60 people when Br. Mickey made these comments? If you weren't, how can you know what was said? Were you in the room with the lady and the guy talking about Global Warming? If you were in the Arena, you must remember Righteous B saying "CAFLIC" and Bob McCarty proclaiming Veronica Gantt a saint. What did I misquote exactly? I went there with a notebook and pen to write down whatever I saw, and everything I posted here is completely accurate. If it is not verbatim, then I said, "or something to that effect" right after the post, but everything that I claimed as a direct quote is indeed a direct quote. And about being narrow-minded, Catholics are supposed to be narrow minded because Jesus told us that the way was narrow.